For cultural visits Grand Hotel Leveque located between the Eiffel Tower and Les Invalides in the 7th arrondissement is a privileged place. More than an exhibition, it is an experience in the Grand Palais. Travelling by coach, train, boat or harmony, accompanied by the most sophisticated baggage, and even the smartest, the most revolutionary of their time. The first Vuitton trunks were manufactured in 1854, they had the domed top, because they were traveling outside the audit, it was necessary that the rain flows over the trunk. But when the trip became collective, with the appearance of cars and bunkers reserved for luggage, Louis Vuitton was the first to invent the flat suitcase that suddenly could stack up. From 1854 to today, the innovations of this type no longer stopped. Still as shocking. 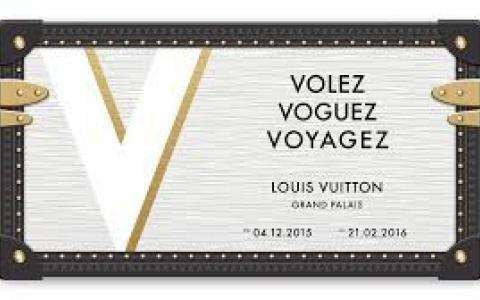 In fact, the history of Louis Vuitton is closely linked to the transport, she accompanied the Industrial Revolution. Trying to make it beautiful and practical. "The beautiful background is not necessarily the great trunk of 1.50 meters high with lockers, drawers and sophisticated accessories," claims Patrick Louis Vuitton, the great grand-son of the founder of Backyard brand . If this box shirt is simplicity itself, we must see the refinement of toiletry elegant 1920s with ivory combs, brushes tortoiseshell and the dozens of perfume bottles glass or crystal, so delicate package to. You will remember the day before each of your holiday departures. In another room, Robert Carsen, the director of this exhibition has installed a sand dune on which he asked the trunk of one of our greatest explorers Pierre Savorgnan de Brazza, that trunk is a bed, and side, the other trunk is an office. For explorers, the époqueavaient need to sleep and write. "Today, they have much more sophisticated applications when they cross the desert," said Patrick Louis Vuitton. The most fascinating exhibition at the Grand Palais Vuitton, the music room where stands the Stradivarius belonging to the trunk maker. It landed near his case, made by Patrick Louis Vuitton himself. Among the most sumptuous trunks include those of the Maharajah of Barodie. As he loved drinking tea on the back of his elephant, he commissioned a Louis Vuitton "tea box". Another surprise: a collector of conductor rods has recently making a case for his fifty chopsticks box. He wished to remain anonymous. All these Vuitton trunks, chosen by Olivier Saillard, curator of the exhibition and directed by Robert Carsen, are traveling and turning his head from 4 December to 21 February 2016. All the more intoxicating than the exhibition is free.